Regional languages used at state and municipal levels. The Federated States of Micronesia (/ˌmaɪkroʊˈniːʒə/ (listen); abbreviated FSM and also known simply as Micronesia) is an independent republic associated to the United States. It consists of four states – from west to east, Yap, Chuuk, Pohnpei and Kosrae – that are spread across the Western Pacific Ocean. Together, the states comprise around 607 islands (a combined land area of approximately 702 km2 or 271 sq mi) that cover a longitudinal distance of almost 2,700 km (1,678 mi) just north of the equator. They lie northeast of New Guinea, south of Guam and the Marianas, west of Nauru and the Marshall Islands, east of Palau and the Philippines, about 2,900 km (1,802 mi) north of eastern Australia and some 4,000 km (2,485 mi) southwest of the main islands of Hawaii. While the FSM's total land area is quite small, it occupies more than 2,600,000 km2 (1,000,000 sq mi) of the Pacific Ocean, giving the country the 14th largest Exclusive Economic Zone in the world. The sovereign island nation's capital is Palikir, located on Pohnpei Island, while the largest city is Weno, located in the Chuuk Atoll. The FSM was formerly a part of the Trust Territory of the Pacific Islands (TTPI), a United Nations Trust Territory under U.S. administration, but it formed its own constitutional government on May 10, 1979, becoming a sovereign state after independence was attained on November 3, 1986 under a Compact of Free Association with the United States. Other neighboring island entities, and also former members of the TTPI, formulated their own constitutional governments and became the Republic of the Marshall Islands (RMI) and the Republic of Palau (ROP). The FSM has a seat in the United Nations and has been a member of the Pacific Community since 1983. The ancestors of the Micronesians settled over four thousand years ago. A decentralized chieftain-based system eventually evolved into a more centralized economic and religious culture centered on Yap Island. Nan Madol, consisting of a series of small artificial islands linked by a network of canals, is often called the Venice of the Pacific. It is located on the eastern periphery of the island of Pohnpei and used to be the ceremonial and political seat of the Saudeleur dynasty that united Pohnpei's estimated 25,000 people from about AD 500 until 1500, when the centralized system collapsed. European explorers—first the Portuguese in search of the Spice Islands (Indonesia) and then the Spanish—reached the Carolines in the sixteenth century. The Spanish incorporated the archipelago to the Spanish East Indies through the capital, Manila, and in the 19th century established a number of outposts and missions. In 1887, they founded the town of Santiago de la Ascension in what today is Kolonia on the island of Pohnpei. Following defeat in the Spanish–American War, the Spanish sold the archipelago to Germany in 1899 under the German–Spanish Treaty of 1899. Germany incorporated it into German New Guinea. During World War I, it was captured by Japan. Following the war, the League of Nations awarded a mandate for Japan to administer the islands as part of the South Pacific Mandate. Following World War II, it was administered by the United States under United Nations auspices in 1947 as part of the Trust Territory of the Pacific Islands pursuant to Security Council Resolution 21. On May 10, 1979, four of the Trust Territory districts ratified a new constitution to become the Federated States of Micronesia. Palau, the Marshall Islands, and the Northern Mariana Islands chose not to participate. The FSM signed a Compact of Free Association with the United States, which entered into force on November 3, 1986, marking Micronesia's emergence from trusteeship to independence. Independence was formally concluded under international law in 1990, when the United Nations officially ended the Trusteeship status pursuant to Security Council Resolution 683. The Compact was renewed in 2004. The Federated States of Micronesia is governed by the 1979 constitution, which guarantees fundamental human rights and establishes a separation of governmental powers. The unicameral Congress has fourteen members elected by popular vote. Four senators—one from each state—serve four-year terms; the remaining ten senators represent single-member districts based on population, and serve two-year terms. The President and Vice President are elected by Congress from among the four state-based senators to serve four-year terms in the executive branch. Their congressional seats are then filled by special elections. The president and vice president are supported by an appointed cabinet. There are no formal political parties. Australia gave Micronesia three Pacific Forum patrol vessels, to help it police its own Exclusive Economic Zone. In international politics, the Federated States of Micronesia has often voted with the United States with respect to United Nations General Assembly resolutions. The FSM is a sovereign, self-governing state in free association with the United States of America, which is wholly responsible for its defense. The Division of Maritime Surveillance operates a paramilitary Maritime Wing and a small Maritime Police Unit. The Compact of Free Association allows FSM citizens to join the U.S. military without having to obtain U.S. permanent residency or citizenship, allows for immigration and employment for Micronesians in the U.S., and establishes economic and technical aid programs. FSM has foreign relations with 56 countries, including the Holy See. FSM was admitted to the United Nations based on the Security Council's recommendation on August 9, 1991 in Resolution 703 and the General Assembly's approval on September 17, 1991 in Resolution 46/2. The FSM is an active member of the Pacific Islands Forum. A map of the Federated States of Micronesia. These states are further divided into municipalities. "... The Ministry recognises that it is a certain fact and historic truth due to Article 3 of the Treaty of July 1, 1899, that Spain reserved a series of rights in Micronesia and for another thing, the specifications of the territories which Spain ceded in 1899 leaves apart certain groups of islands in the same zone." Successive Spanish governments have not abandoned Spain's sovereignty, or insisted on enforcing it, or recognized the sovereignty of the Federated States of Micronesia over Kapingamarangi. The Federated States of Micronesia claims sovereignty and has de facto control of the island. The Federated States of Micronesia consists of 607 islands extending 2,900 km (1,802 mi) across the archipelago of the Caroline Islands east of the Philippines. The islands have a combined area of 702 km2 (271 sq mi). The Federated States of Micronesia is served by four international airports. Pohnpei International Airport, on the main island of Pohnpei State. Chuuk International Airport, located on the main island of Chuuk State. Kosrae International Airport, located on the main island of Kosrae State. Yap International Airport, located on the main island of Yap State. Economic activity in the Federated States of Micronesia consists primarily of subsistence farming and fishing. The islands have few mineral deposits worth exploiting, except for high-grade phosphate. Long line fishing of tuna is also viable with foreign vessels from China that operated in the 1990s. The potential for a tourist industry exists, but the remoteness of the location and a lack of adequate facilities hinder development. Financial assistance from the U.S. is the primary source of revenue, with the U.S. pledged to spend $1.3 billion in the islands in 1986–2001; when the Compact was amended in 2004, the United States committed to providing $110 million in development aid through 2023. The CIA World Factbook lists high dependence on U.S. aid as one of the main concerns of the FSM. Geographical isolation and a poorly developed infrastructure are major impediments to long-term growth. The indigenous population of the nation, which is predominantly Micronesian, consists of various ethnolinguistic groups. It has a nearly 100% Pacific Islander and Asian population: Chuukese 48.8%, Pohnpeian 24.2%, Kosraean 6.2%, Yapese 5.2%, Yap outer islands 4.5%, Asian 1.8%, Polynesian 1.5%, other 6.4%, unknown 1.4%. A sizeable minority also have some Japanese ancestry, which is a result of intermarriages between Japanese settlers and Micronesians during the Japanese colonial period. There is also a growing expatriate population of Americans, Australians, Europeans, and residents from China and the Philippines since the 1990s. English has become the common language of the government, and for secondary and tertiary education. Outside of the main capital towns of the four FSM states, the local languages are primarily spoken. Population growth remains high at more than 3% annually, offset somewhat by net emigration. English is the official and common language. Also spoken are Chuukese, Kosraean, Pohnpeian, Yapese, Ulithian, Woleaian, Nukuoro, and Kapingamarangi. Other languages spoken in the country include Pingelapese, Ngatikese, Satawalese, Puluwatese, Mortlockese, and Mokilese. There are about 3,000 speakers of Kapingamarangi and Ulithian, and under 1,000 speakers of Nukuoro. Most Micronesians are Christian. Several Protestant denominations, as well as the Roman Catholic Church, are present in every Micronesian state. Most Protestant groups trace their roots to American Congregationalist missionaries. On the island of Kosrae, the population is approximately 7,800; 95 percent are Protestants. On Pohnpei, the population of 35,000 is evenly divided between Protestants and Catholics. Most immigrants are Filipino Catholics who have joined local Catholic churches, e.g. Our Lady of Mercy Catholic Church in Pohnpei. On Chuuk and Yap, an estimated 60 percent are Catholic and 40 percent are Protestant. Religious groups with small followings include Baptists, Assemblies of God, Salvation Army, Seventh-day Adventists, Jehovah's Witnesses, The Church of Jesus Christ of Latter-day Saints (Mormons), and the Bahá'í Faith. There is a small group of Buddhists on Pohnpei, and a small group of Ahmadiyya Muslims in Kosrae. Attendance at religious services is generally high; churches are well supported by their congregations and play a significant role in civil society. In the 1890s, on the island of Pohnpei, intermissionary conflicts and the conversion of clan leaders resulted in religious divisions along clan lines which persist today. More Protestants live on the western side of the island, while more Catholics live on the eastern side. Missionaries of many religious traditions are present and operate freely. The Constitution provides for freedom of religion, and the Government generally respected this right in practice. The US government received no reports of societal abuses or discrimination based on religious belief or practice in 2007. The sport of football in the Federated States of Micronesia is run by the Federated States of Micronesia Football Association. They control the Micronesian Games, the nation's football championship and the Micronesia national football team. The Federated States of Micronesia Athletic Association is the governing body for the country's sports and athletics. A large (approximately 2.4 m or about 8 ft in height) example of Yapese stone money (Rai stones) in the village of Gachpar. Each of the four states has its own culture and traditions, but there are also common cultural and economic bonds that are centuries old. Cultural similarities include the importance of the traditional extended family and clan systems and are found on all the islands. The island of Yap is notable for its "stone money" (Rai stones), large disks usually of calcite, up to 4 meters (13 ft) in diameter, with a hole in the middle. The islanders, aware of the owner of a piece, do not necessarily move them when ownership changes. There are five major types: Mmbul, Gaw, Ray, Yar, and Reng, the last being only 30 cm (12 in) in diameter. Their value is based on both size and history, many of them having been brought from other islands, as far as New Guinea, but most coming in ancient times from Palau. Approximately 6,500 of them are scattered around the island. Pohnpei is home to Nan Madol: Ceremonial Centre of Eastern Micronesia, a UNESCO World Heritage Site, but the site is currently listed as In Danger due to natural causes. The government is working on the conservation of the site. There have been very few published literary writers from the Federated States of Micronesia. In 2008, Emelihter Kihleng became the first ever Micronesian to publish a collection of poetry in the English language. ^ Summary Analysis of Key Indicators: from the FSM 2010 Census of Population and Housing (PDF). Palikir: Division of Statistics, Office of SBOC. p. 8. Retrieved 16 March 2018 – via Prism (SPC). ^ Kehoe, Monika. "Language of Micronesia and Guam" (PDF). Archived (PDF) from the original on February 9, 2017. ^ "Drops in the ocean: France's marine territories". ^ General Assembly - Overall Votes - Comparison with U.S. vote Archived June 26, 2017, at the Wayback Machine lists Micronesia as in the country with the fourth high coincidence of votes. Micronesia has always been in the top four. ^ "U.S. Military Enlistment Standards" (PDF). Archived from the original (PDF) on 2008-10-01. ^ "Federated States of Micronesia". U.S. Department of the Interior. Archived from the original on October 23, 2016. Retrieved December 2, 2016. ^ a b c d "The World Factbook -- Central Intelligence Agency". Cia World Factbook. Archived from the original on 7 August 2018. Retrieved 8 August 2018. ^ "FSM Population". www.fsmgov.org. Archived from the original on June 29, 2012. Retrieved January 22, 2017. ^ "Federated States Of Micronesia (FSM) Division of Civil Aviation l Pohnpei International Airport (PNI) (PTPN), Pohnpei Island, Micronesia". Federated States of Micronesia Division of Civil Aviation. 7 August 2018. Archived from the original on 8 August 2018. Retrieved 7 August 2018. ^ "Federated States of Micronesia (FSM) Division of Civil Aviation l Chuuk International Airport (TKK) (PTKK) Weno Island, Micronesia". Federated States of Micronesia Division of Civil Aviation. 7 August 2018. Archived from the original on 8 August 2018. Retrieved 7 August 2018. ^ "Federated States of Micronesia (FSM) Division of Civil Aviation l Kosrae International Airport (KSA) (PTSA), Kosrae Island, Micronesia". Federated States of Micronesia Division of Civil Aviation. 7 August 2018. Archived from the original on 8 August 2018. Retrieved 7 August 2018. ^ "Federated States of Micronesia (FSM) Division of Civil Aviation l Yap International Airport (YAP) (PTYA), Wa'ab, Micronesia". Federated States of Micronesia Department of Civil Aviation. 7 August 2018. Archived from the original on 8 August 2018. Retrieved 7 August 2018. ^ "US Relations with the Federated States of Micronesia". United States Department of State. ^ "Federated States of Micronesia". United Nations. Archived from the original on November 30, 2012. Retrieved 17 November 2012. ^ "Micronesia". Ethnologue. Retrieved 2019-02-01. ^ a b c d e f g h i j k l m n o International Religious Freedom Report 2007: Micronesia, Federated States of Archived January 13, 2012, at the Wayback Machine. United States Bureau of Democracy, Human Rights and Labor (September 14, 2007). This article incorporates text from this source, which is in the public domain. ^ "Nan Madol: Ceremonial Centre of Eastern Micronesia - UNESCO World Heritage Centre". UNESCO World Heritage Centre. 7 August 2018. Archived from the original on 7 August 2018. Retrieved 7 August 2018. Arnold, Bruce Makoto (2011). "Conflicted Childhoods in the South Seas: The Failure of Racial Assiimilation in the Nan'yo". Tufts Historical Review. 4 (11): 79–96. Brower, Kenneth; Harri Peccinotti (1981). Micronesia: The Land, the People, and the Sea. Baton Rouge: Louisiana State University Press. ISBN 978-0-8071-0992-2. Darrach, Brad; David Doubilet (1995). "Treasured Islands". Life (August 1995): 46–53. Falgout, Suzanne (1995). "Americans in Paradise: Anthropologists, Custom, and Democracy in Postwar Micronesia". Ethnology. 34 (Spring 1995): 99–111. doi:10.2307/3774100. JSTOR 3774100. Friedman, Hal M. (1993). "The Beast in Paradise: The United States Navy in Micronesia, 1943–1947". Pacific Historical Review. 62 (May 1993): 173–195. doi:10.2307/3639910. JSTOR 3639910. Friedman, Hal M. (1994). "Arguing over Empire: American Interservice and Interdepartmental Rivalry over Micronesia, 1943-1947". Journal of Pacific History. 29 (1): 36–48. doi:10.1080/00223349408572757. Hanlon, David (1998). Remaking Micronesia: Discourses over Development in a Pacific Territory, 1944–1982. Honolulu: University of Hawaii Press. ISBN 978-0-8248-1894-4. Hezel, Francis X. (1995). "The Church in Micronesia". America. 18 (February 1995): 23–24. Kluge, P. F. (1991). The Edge of Paradise: America in Micronesia. New York: Random House. ISBN 978-0-394-58178-1. Malcomson, S. L. (1989). "Stranger than Paradise". Mother Jones. 14 (January 1989): 19–25. "Micronesia: A New Nation". U.S. News & World Report (October 15, 1984): 80–81. Parfit, Michael (2003). "Islands of the Pacific". National Geographic. 203 (March 2003): 106–125. Patterson, Carolyn Bennett (1986). "In the Far Pacific: At the Birth of Nations". National Geographic. 170 (October 1986): 460–500. Peoples, James G. (1993). "Political Evolution in Micronesia". Ethnology. 32 (Winter 1993): 1–17. doi:10.2307/3773542. JSTOR 3773542. Rainbird, Paul (2003). "Taking the Tapu: Defining Micronesia by Absence". Journal of Pacific History. 38 (2): 237–250. doi:10.1080/0022334032000120558. Schwalbenberg, Henry M.; Hatcher, Thomas (1994). "Micronesian Trade and Foreign Assistance: Contrasting the Japanese and American Colonial Periods". Journal of Pacific History. 29 (1): 95–104. doi:10.1080/00223349408572762. "Federated States of Micronesia". The World Factbook. Central Intelligence Agency. 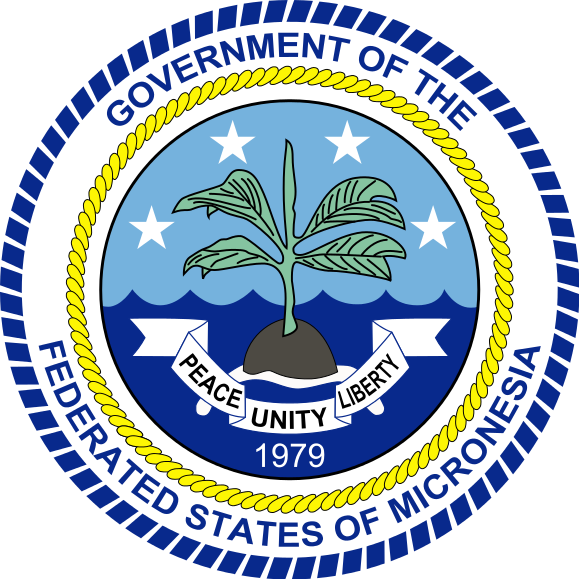 The Federated States of Micronesia is a federation divided into four states, which are further divided into various cities and municipalities. Diplomatic relations between China and the Federated States of Micronesia were established on September 11, 1989. The Chinese government first established an embassy in the capital of Palikir in 1990, and dispatched its first ambassador in 1991. Initially, the Micronesian ambassador to Tokyo, Japan also served as Micronesia's ambassador to China, before Micronesia established an embassy in Beijing in 2007. President John Haglelgam was the first senior government agent from Micronesia to visit China, doing so in 1990. The current Chinese ambassador to Micronesia is Zhang Weidong, while the Micronesian ambassador to Beijing is Akillino H. Susaia. The Congress of the Federated States of Micronesia has 14 non-partisan members: 10 members elected for a two-year term in 10 single-seat constituencies and 4 members elected for a four-year term, one from every state 'at large'. 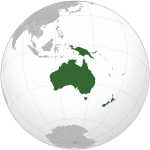 The Federated States of Micronesia competed in the Olympic Games for the first time at the 2000 Summer Olympics in Sydney, Australia. The Federated States of Micronesia competed at the 2011 World Championships in Athletics from August 27 to September 4 in Daegu, South Korea. Federated States of Micronesia competed at the 2014 Summer Youth Olympics, in Nanjing, China from 16 August to 28 August 2014. Athletes from the Federated States of Micronesia have competed in the Summer Olympic Games five times, but have yet to win any medals. Federated States of Micronesia–United States relations are bilateral relations between the Federated States of Micronesia and the United States of America. The flag of the Federated States of Micronesia (FSM) was adopted on 30 November 1978. The blue field represents the Pacific Ocean, while the four stars represent the states in the federation: Chuuk, Pohnpei, Kosrae and Yap. Japanese settlement in what now constitutes modern-day Federated States of Micronesia (FSM) dates back to the end of the 19th century, when Japanese traders and explorers settled on the central and eastern Carolines, although earlier contacts can not be completely excluded. After the islands were occupied by Japan in 1914, a large-scale Japanese immigration to them took place in the 1920s and 1930s. The Japanese government encouraged immigration to the islands belonging to the South Pacific Mandate to offset demographic and economic problems facing Japan at that time. The earliest immigrants worked as traders, although most of the later settlers worked as fishermen, farmers or conscript labourers. The majority of immigrants settled in Pohnpei and Chuuk, while other islands were home for only a few Japanese. The total Japanese population reached about 100,000 by 1945. The Japanese immigrants in the central and eastern Carolines were Japanese, Okinawans, and a few Koreans. The settlers brought Shinto and Buddhism religions to the islands, although they were not popular with indigenous people. By 1945 the Japanese language replaced Micronesian languages in day-to-day communications. Ethnic relations between the Japanese settlers and civil officers with the Micronesians were initially coordial and intermarriage was encouraged between the Japanese and Micronesians, although relations soured as the Japanese administration implemented policies that favoured the Japanese populace and were insensitive to Micronesian cultural norms. After the Japanese surrender in 1945, virtually all Japanese were repatriated back to Japan. People of mixed Japanese and Micronesian descent were allowed to remain, which most of them chose to do. Many of them assumed leading roles in the political, public and business sectors after World War II, and constitute a large minority within FSM itself. Micronesia began to engage with Japan again in the business and cultural spheres from the 1970s, and established formal diplomatic ties in 1988, two years after Federated States of Micronesia (FSM) became an independent country. The following are the national records in athletics in Micronesia maintained by Micronesia's national athletics federation: Federated States of Micronesia Athletic Association (FSMAA). The traditional music of the Federated States of Micronesia varies widely across the four states, and has, in recent times, evolved into popular music influenced by Europop, country music and reggae. This is a list of the buildings, sites, districts, and objects listed on the National Register of Historic Places in the Federated States of Micronesia. There are currently 26 listed sites located in all 4 states of the Federated States of Micronesia. The politics of the Federated States of Micronesia (FSM) takes place in a framework of a federal representative democratic republic. The President of the Federated States of Micronesia is both head of state and head of government. Executive power is exercised by the president and his cabinet, while legislative power is vested in both the president and the Congress. The judiciary is independent of the executive and the legislature. The internal workings of the Micronesia are governed by the 1979 constitution, which guarantees fundamental human rights and establishes a separation of governmental powers. The Federation is in free association with the United States; the Compact of Free Association entered into force 3 November 1986. The President of the Federated States of Micronesia is the head of government and head of state of the Federated States of Micronesia. The president is elected by the Congress (Legislature) from among its members. Presidents pick cabinet members from the Congress. Several Protestant denominations, as well as the Roman Catholic Church, are active in every Micronesian state. Most Protestant groups trace their roots to American Congregationalist missionaries. On the island of Kosrae, the population is approximately 7,800; (95% Protestant). On Pohnpei, the population of 35,000 is evenly divided between Protestants and Catholics (50% catholic & 50% Protestant). On Chuuk and Yap, (an estimated 60% Catholic & 40% Protestant). Religious groups with small followings include Baptists, Assemblies of God, Salvation Army, Seventh-day Adventists, Jehovah's Witnesses, the Church of Jesus Christ of Latter-day Saints (Mormons), and the Baha'i Faith. There is a small group of Buddhists on Pohnpei, (0.7% Buddhist) (population as of 2010). Attendance at religious services is generally high; churches are well supported by their congregations and play a significant role in civil society. The Ahmadiyya Muslims were registered in Kosrae in July 2015, despite strong public resistance against Islam in the country.Most immigrants are Filipino Catholics who have joined local Catholic churches. The Filipino Iglesia Ni Cristo also has a church in Pohnpei. In the 1890s, on the island of Pohnpei, intermissionary conflicts and the conversion of clan leaders resulted in religious divisions along clan lines which persist today. Protestants are the majority on the western side of the island, while Catholics are the majority on the eastern side. Missionaries of many religious traditions are present and operate freely. The Constitution provides for freedom of religion, and the Government generally respected this right in practice. The US government received no reports of societal abuses or discrimination based on religious belief or practice in 2007. All visitors arriving in the Federated States of Micronesia must have a valid passport or other travel document issued by the government of the country of citizenship or nationality. The document must be valid for at least 120 days beyond the date of entry. Exception to this rule are the citizens and nationals of the Federated States of Micronesia, Republic of Palau, the Republic of the Marshall Islands, or the United States who may also prove citizenship or nationality by birth certificate or entry permit. Their nationals are also issued an entry permit valid for up to a year. Other nationalities are allowed stay of 30 days that may be extended up to 60 days. Departure Tax applies.Micronesia signed a mutual visa-waiver agreement with the European Union on 20 September 2016. This agreement allows all citizens of states that are contracting parties to the Schengen Agreement to stay without a visa for a maximum period of 90 days in any 180-day period. Women in the Federated States of Micronesia are women who live in or are from the Federated States of Micronesia, an independent sovereign island nation composed of four states. Thus, FSM women includes women from the States of Yap, Chuuk, Pohnpei (formerly Ponape) and Kosrae (previously known as Kusaie).